The blitz battle of 16 games which had to decide the outcome of the Nakamura vs Aronian exhibition match after the classical part had been equal (2-2) has ended in favour of the American GM: 9.5-6.5. 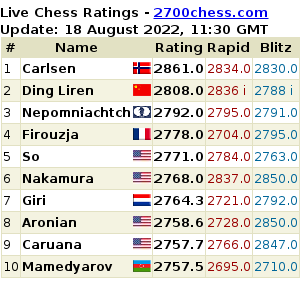 While everybody is waiting eagerly for the crucial events to begin in the World Championship match in Sochi, another notable match has started in the U.S. city of Saint Louis where the best American player Hikaru Nakamura is facing Armenian super-GM Levon Aronian. 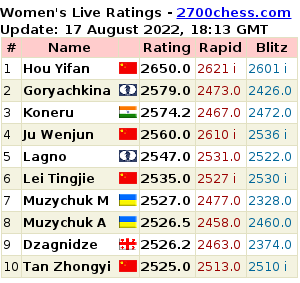 As we have already announced earlier, the match consists of 4 classical games in the first four days, which will be followed by the blitz battle of 16 games in the final day. After the starting loss, Levon Aronian fought back in the second game of his match vs Hikaru Nakamura taking place in Saint Louis. Thus, the score is 1-1. The 3rd game can be watched LIVE at the official website. Armenian GM Levon Aronian played for Baden-Baden at German Bundesliga on the weekend. Out of three games, he won two and drew one. Yesterday Judit Polgar made a present for Vladimir Kramnik on already the 11th move, thus turning the game for Russian GM into a warm-up session. Hungarian sacrificed a piece without enough compensation and Kramnik left her no chances while converting his advantage.